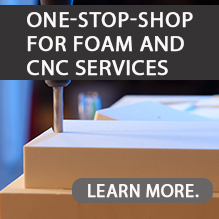 LAST-A-FOAM® provides an extremely stable and precise material for product prototypes and design models. Whether you are building a sports car, an aircraft prototype, or a topographical map, it is an outstanding creative medium that supports accuracy and fine detail. These modeling foams are easily shaped to create amusement park façades, movie props and polyurethane sculptures, or formed into custom-bonded blocks. General Plastics’ modeling foam also serves as an outstanding foundation for impressive environmental graphics and displays. Transform it into extraordinary display models and larger-than-life creations. The impervious, nearly indestructible material is lightweight yet remarkably strong and stable over time. It is formulated to withstand extreme temperatures. For making oversize figures or displays, our modeling foam board can be securely bonded using a variety of adhesive systems. Read this case application to learn how a space and aircraft industry supplier benefited from General Plastics’ FR-7100 Multi-Use Core Series for low-cost, fast-turn prototyping.